Spring is coming! 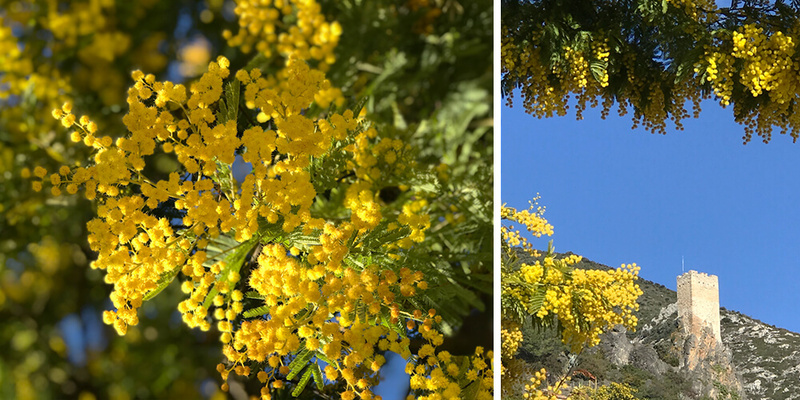 In Roquebrun at least, where “La fête du Mimosa” is celebrated every second Sunday in February. 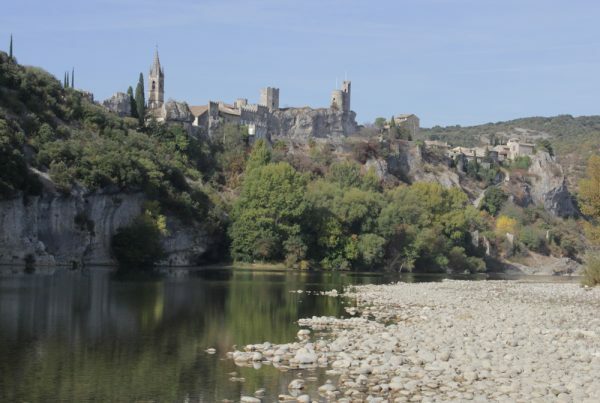 Roquebrun is a beautifully situated village on the banks of the Orb River. 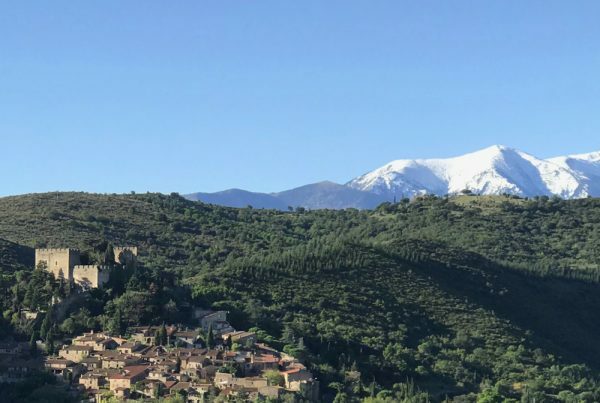 Locally known as the Nice of Hérault, it benefits from a microclimate. Perfect for mimosa to grow! That is why Roquebrun traditionally celebrates Spring: in honour of this flower. As I wanted to see the parade in the afternoon, I arrived a bit in advance. 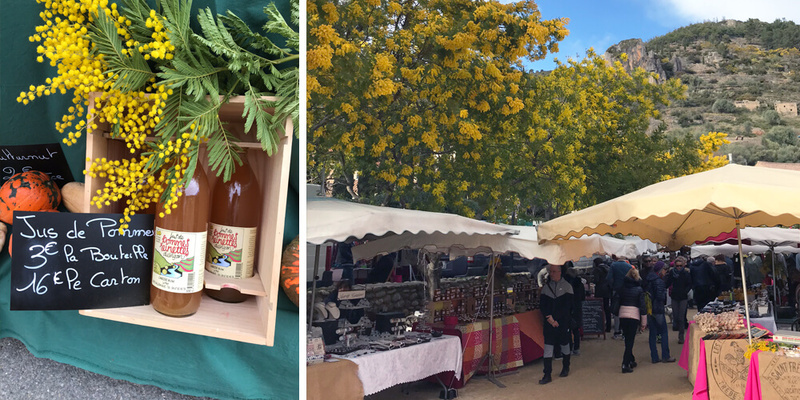 A smart thing to do, as I wasn’t quite alone… La Fête du Mimosa is a very popular celebration and attracts many people. You cannot drive into Roquebrun; the road is blocked. However, I found a nice little spot in line with the other cars that were parked beside the road. 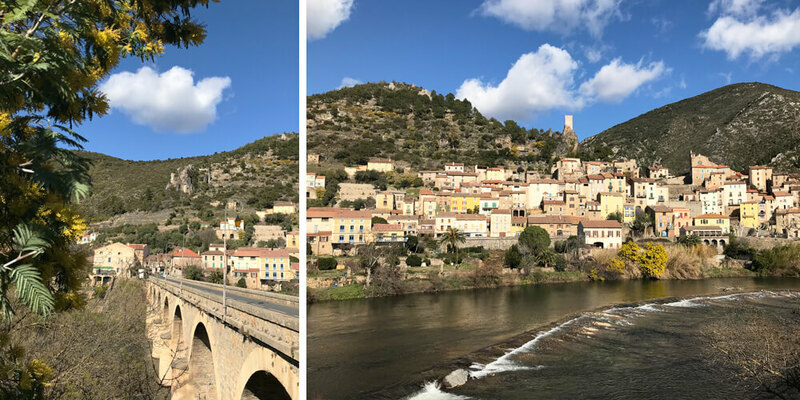 I could have taken the free shuttle bus that drives up and down the parking and Roque, but as the surroundings around Roquebrun are so beautiful, it wasn’t a punishment to walk the 2 kilometres to the village. My planning skills were on point, as I arrived perfectly on time for the colourful parade along the main road. Enough time to enjoy a little lunch at one of the many food stalls. 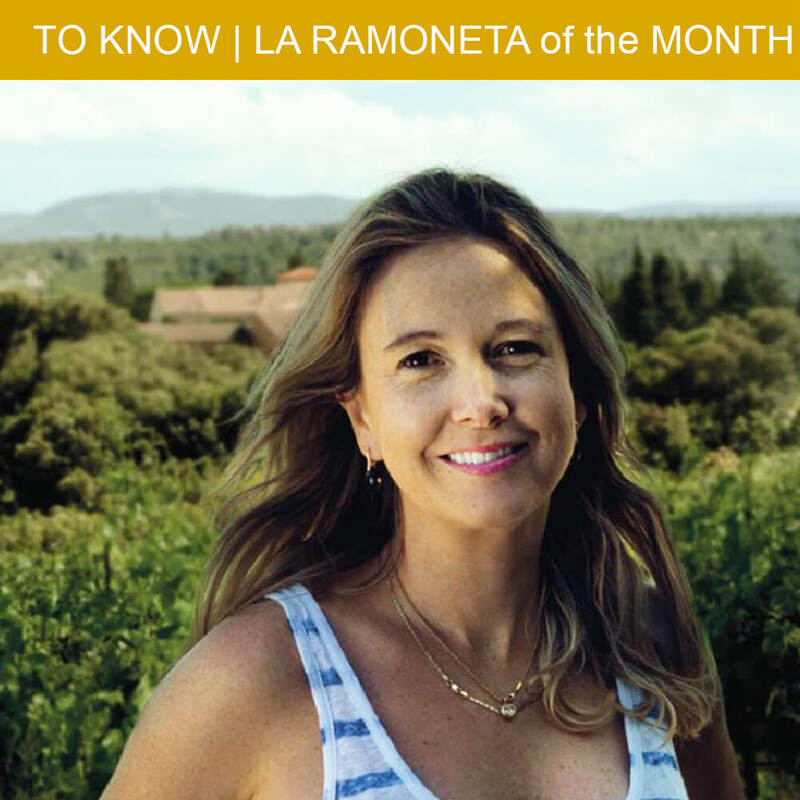 Accompanied with a perfect glass of local white wine from La Cave Saint Martin. Although the parade only has seven floats, it is still good fun to watch this folklore festival. 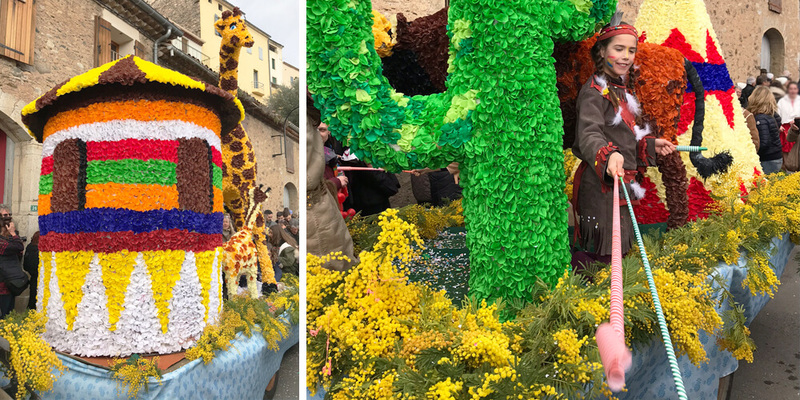 The procession started with “Lou Pouli”, the totemic animal from Alignan-du-Vent. It is one of the most well-known totemic animals in the Languedoc region. A few strong men and women carried this bull, while the “Cicadas” dance and play music around it. The parade is such a happy and cheerful collection of colourful floats, musical bands, majorettes and even a float with a fountain of wine! This year’s theme was “The Animals of the World”. Hundreds of hours have been spent putting the thousands of paper flowers on the floats. To be decorated last-minute with great bunches of bright yellow mimosa. Even the tractors that are pulling the floats are beautifully dressed up with mimosa blossoms. All of a sudden the crowd around me was moving away while calling “flour, flour”! 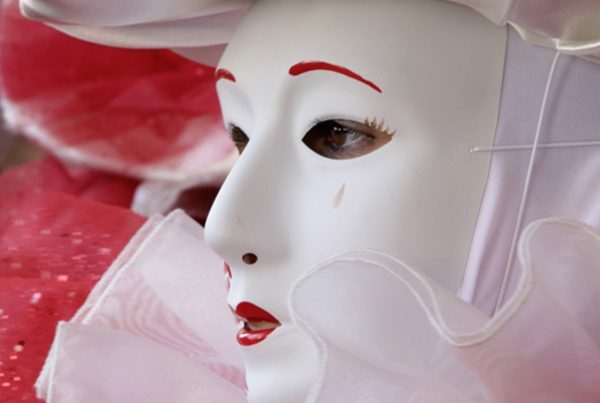 I didn’t quite understand the fuss, until I saw some men and women dressed in white nightgowns, including the nightcaps. 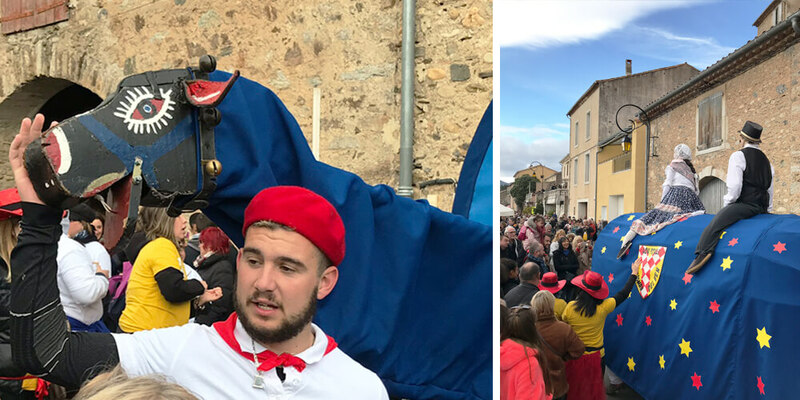 Another Languedoc tradition, this was the “Danse de la Buffatière”. While dancing around a wheelbarrow filled with flour, the men and women blow the flour onto themselves and, of course, the bystanders surrounding them. With great laughs and many white faces as a result! No worries if you miss the parade, it drives up and down the main road endlessly. I had never seen such a crowd in Roquebrun before. The music, dances, parade, combined with lovely food and drinks gave the village a fantastic atmosphere. In the end, I even made it to the small funfair and market with local producers and artisans. All in all, it was a fun day out. And as far as I am concerned, Spring may come! 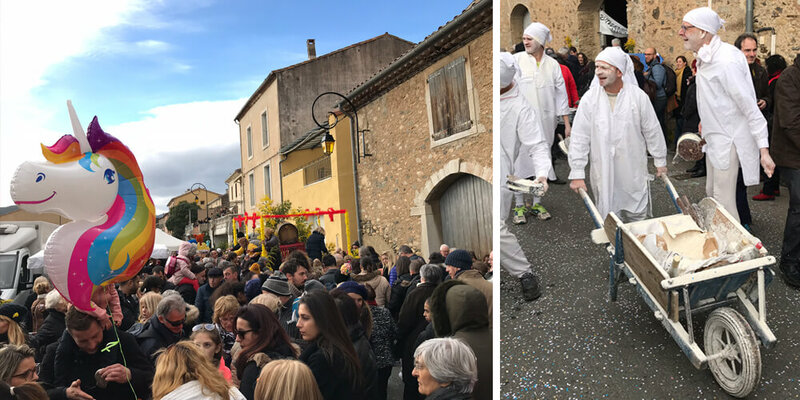 La Fête du Mimosa in Roquebrun is held annually every second Sunday in February. There is only one main road in Roquebrun; you cannot miss it. As the festival is well visited, you can park your car at the side of the road before arriving at Roquebrun. A free shuttle bus drives up and down to Roquebrun.